Actually I think this colour is that funny green and not brown! Oyster perhaps!! Don't be put off that this has the same name as another that I posted earlier, as it has a different number and when a pattern wasn't used any more, they appear to use the same pattern name again. 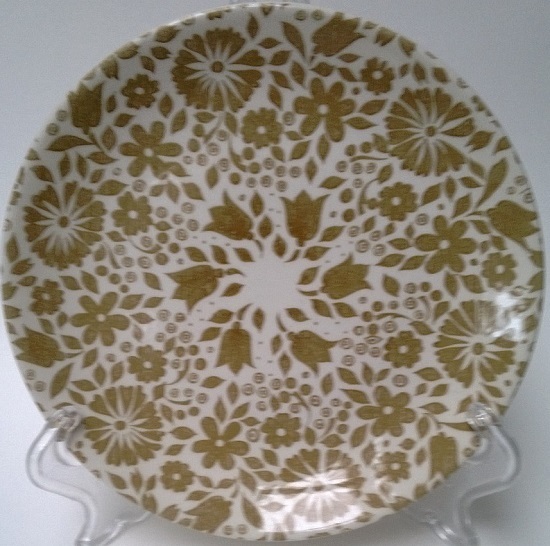 This pattern with a brown rim band is Botany Brown d223 and also with a brown rim band but in yellow tones is Botany Gold d224. It's that strange odd green that always trips us up into thinking it's brown. Glendale Green has Olive Green 3019 [shape 25] cups that go with it. 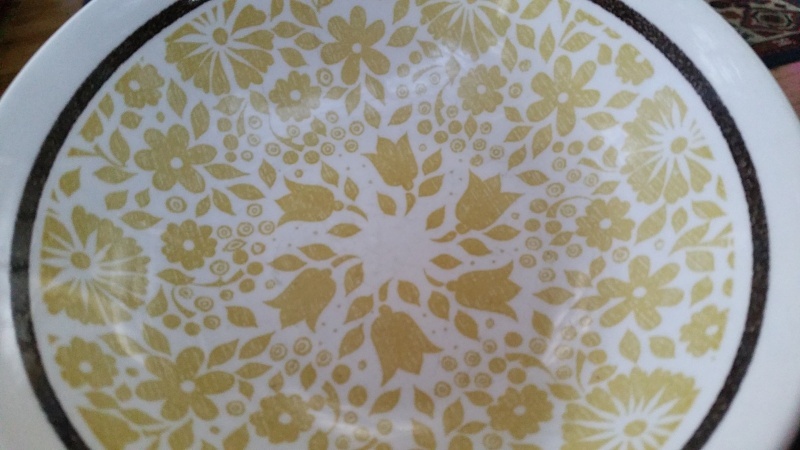 I'm inclined to think that this pattern would go with Olive Green, what do you reckon? So, would the 'No name pattern from kiwi2768' in the no names gallery be Glendale too? Wonder what this pattern is? This is a yellow version of glendale type pattern with the brown band. I don't recall seeing this one in the museum notes. Found this one Janice thanks to saving the DS numbers. Botany Gold d224 and it has Primrose 3019 cups. In the no names gallery there is Glendale (Brown version) and Glendale Green 397 in the gallery. Glendale d399 has Olive Green 3019 cups. What are your thoughts Janice? I feel I have tried to figure this out before. The only reference I have for Glendale 397 is the Auckland museum index for patterns. I agree it does not indicate what colour it is. The Auckland Index seems to 'follow a theme" and has the same pattern names in 3 colours Green, Gold and Brown. In this case only Glendale 397 and Glendale Green 399 are noted. Later we both found in the Portage Trust notes it has the gold version without a pattern number. So I think I was guessing that Glendale 397 was brown. I have both these patterns so I matched them up and they are that same swampy green colour. So would the one in the main gallery be the Glendale Green 399 and the "no-names" at a guess could be brown version 397? but until its confirmed would have to stay as un-named. Lets go with Glendale d397 for the Brown one in the No Names Gallery. It can't be anything else really, now that you have confirmed the green one. I will name it now and move it into the proper place. ps we are only 8 patterns away from 1500 counting the no namers of course!